Mary Louise Rademacher age 89, of St. Johns, MI, passed away Tuesday, August 21, 2018, at her home surrounded by her family. A Mass of Christian Burial will be held at St. Joseph Catholic Church, St. Johns, MI, on Friday, August 24, 2018, at 10:00 A.M., with Rev. Fr. Michael Williams officiating. Burial will take place at Mt. Rest Cemetery, St. Johns, MI. Visitation will be held on Thursday, August 23, 2018 from 2-8 P.M. with family present from 2-4 & 6-8 P.M. at Smith Family Funeral Homes - Osgood Chapel, St. Johns, MI. A Rosary will be prayed at 7:30 P.M. on Thursday at the funeral home. Mary was born in Lansing, MI on April 7, 1929, the daughter of Roy and Mary (Coughlin) Quick. Mary married Roderick Rademacher on September 6, 1958 and he passed away on January 6, 1969. 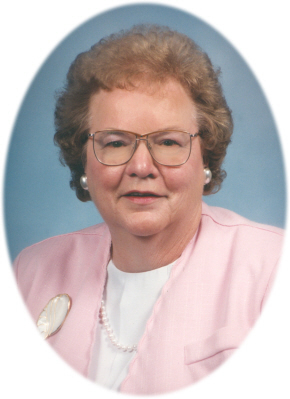 She was a Clinton County Commissioner, Bengal Township Treasurer and a City of St. Johns retiree. Mary was a member of St. Joseph Catholic Church, St. Johns, MI. Mary resided most of her life in St. Johns. She is survived by her children: Anne Rademacher, Daniel & Joan Rademacher, Gerald & Michelle Rademacher, Russell (Sandy Schmitt) Rademacher, Edward & Rachele Rademacher; brother James & Dorothy Quick, sister Donna & David Starr, sister in-laws: Doris Quick, Eugenia & Alban Arens, Marcella Rademacher and MaryLou Rademacher. She is also survived by 11 grandchildren: Elizabeth, Kimberly, Jessica, Nicholas, Brittany, Tyler, Conner, Nicole, Josh, Allyson and Ashley. She was preceded in death by her parents, husband, 2 brothers: William and Charles Quick and 4 sisters: Lorraine Norris, Barbara Ridge, Rita Quick and Joyce Zahn. Memorials may be made to Clinton County RESA, St. Johns, MI or to St. Joseph School Tuition Scholarship. Online condolences can be sent to www.smithfamilyfuneralhomes.com. The family is being served by Smith Family Funeral Homes - Osgood Chapel, St. Johns, MI.